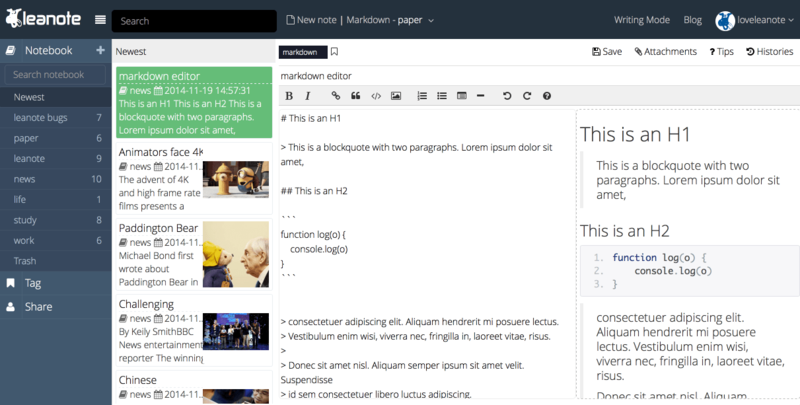 Note-taking made easy: Leanote incorporates a clean and intuitive interface, the tinymce rich-text editor and a dedicated markdown editor, making your writing/typing more efficient and enjoyable. For more advanced users, we even offer Vim and Emacs writing modes to help boost your writing speed to another level. Knowledge management: The flexible and versatile notebook-note-tagging system of Leanote makes it an ideal tool for knowledge management. Sharing: Share your knowledge, thoughts and experiences with friends via Leanote. Invite your friends to join your notepad in the cloud. Cooperating: Collaborate with colleagues to improve skills, fertilize ideas and brainstorm on the fly. Blogging: Publish your work and make Leanote your personal blog. A more powerful editor: Evernote's editor lacks the functionalities of document navigation, syntax based code rendering (as a programmer, syntax highlighted code rendering is a necessity), image resizing and so forth. Everybody loves markdown, however Evernote simply wouldn't add it despite of years' of requests from users. So we will do the favor and bring a markdown enabled editor to you, guess what, it is also rendered in real-time! If you a developer and miss the Vim or Emacs ways of writing, we offer you the choice of Vim and Emacs editing modes. Equipped with markdown syntax for text formatting, you will never need to touch your mouse while writing. We love managing knowledge and thoughts as much as sharing them, so everybody has their own note account (Evernote, Onenote, Google doc, Wiz note etc.) and social media account (Facebook, Wordpress, blogs, etc.). But why can’t those two be one? Leanote makes this first step to bridge the private note-taking and public knowledge sharing seamlessly. A complete and all-platform (sorry Windows phone) covering software suite: that includes Leanote Web & Server (this repository), Desktop app, iOS, Android. And they are all open source! The Leanote software suite contains: Leanote Web & Server (this repository), Desktop app, iOS, Android. Interested in our product and want to try it out from your web browser? Welcome to sign up on https://leanote.com. Feeling suspicious about how those note-taking companies treat your personal data? You can install Leanote on your server, and use Leanote App (Desktop, iOS, Android) to sync notes with your self-hosted server. Please see wiki for detailed instruction on how to install Leanote on various platforms, trouble shooting and configuration explanations. If you are a developer yourself and feel like to build on top of Leanote, please refer to How-to-develop-leanote. Like or dislike Leanote, please leave your comments and suggestions to help us improve it. If you encounter any issue, we suggest you first search the issues section to see whether a solution already exists, or open up a new one otherwise. We’d like to acknowledge the contributions made by our developers and contributors to this project. Leanote won’t exist without your hard work. Your help is much appreciated. Please feel free to fork this repository and contribute back using pull requests. If you find any problems or have any good ideas, feature requests, please submit here issues. If you like our product, consider supporting us via donate us. We acknowledge the donations made by all the donators. Leanote云笔记产品包括: Leanote Web & Server(即本仓库), 桌面客户端, IOS, android. 4端全部开源!